Research demonstrates that substantial human health risks can result from exposure to toxic chemicals present in building products in constructed environments. These health risks can include an increase in cases of asthma, cancer, obesity, and issues related to developmental and reproductive health. The health risks are particularly high for children, pregnant women and people living in poverty. By making simple changes to building products used in renovation we can create better places for all people. Healthy Materials Lab (HML) is a group of design researchers at Parsons School of Design working to bring a consideration of human health to all aspects of design and building practices and is changing how the next generation of designers build- particularly for populations that have been historically excluded. We work to demonstrate and accelerate the many ways in which better materials can improve the health and lives of all people. Specifically, we work towards creating better practices in the affordable housing sector to accelerate the creation of healthier homes nationwide. We aim to reduce exposure to toxics for families living in low-income and affordable housing by making it easier for designers, architects, and housing developers to avoid the most toxic chemicals present in the building materials commonly used in affordable housing. We create a range of tools and resources that will enable these decision makers to inform and change their construction practices throughout the design, building, and occupation by bringing all stakeholders together to be part of the building process. This ensures that human health decisions become incorporated into the final building. Parsons’ design programs often work in New York City communities to support the work of local nonprofit organizations. One such organization is the West Harlem Group Assistance (WHGA), which was founded in 1971 to address the lack of decent affordable housing and social services in Harlem, New York. WHGA has developed over 1,600 units of housing for low and moderate income families, low income seniors, homeless families with children and adults coping with substance abuse and mental health challenges. They work to renovate existing and construct new buildings in West Harlem to provide affordable housing for families. HML began collaborating with WHGA in 2015 to update and improve the building products used in their renovation projects. Our recommendations to use better, healthier products were adopted by the group as part of their typical building protocols, enabling WHGA to build better, healthier buildings for their residents. In 2017 the Parsons Master of Fine Arts Interior Design program’s “Color Lab” class partnered with HML, NYCHA and Mt. Sinai Hospital on the renovation of a community space in East Harlem at Carver Houses. This year, the design students and their two faculty members worked with HML to establish a new project with WHGA and identified possible sites that would act as the physical focus for their studio. This recent collaboration with WHGA was at the Convent Avenue Family Living Center (CAFLC) in West Harlem. The CAFLC is a transitional housing facility for homeless families sponsored by the New York City Department of Housing Preservation and Development (HPD) and managed by WHGA. CAFLC provides emergency housing for families displaced by fires, natural disasters or city-based vacate orders. The center offers self-contained apartments as well as an on-site Housing Readiness Program while displaced families search for permanent housing. Working with the Director of Center, Nadene Gordon, researchers from HML identified spaces that would be the focus for the renovation. HML specified two critical interior product alternatives that would be used in the renovation that are both affordable and healthier, within the categories of paint and flooring. Since paint and flooring cover the majority of the surfaces in the interior, focusing on these products and specifying better alternatives can dramatically improve the health profile of the space. For the flooring, HML specified Forbo Marmoleum tiles as an alternative to the vinyl composite tiles that are ubiquitous in affordable housing and are a potential source of harmful chemicals. Forbo Marmoleum tiles have better performance and maintenance profiles compared to vinyl tiles, have a much longer life, and they do not contain the harmful phthalates that are contained in the vinyl product. For the paint, HML specified Romabio lime-based mineral paint as a healthier alternative to acrylic paints. Romabio is VOC-free, odorless, does not contain asthmagens, and is naturally mold-resistant. As the community spaces are in continuous use during the week by families who have been the victims of traumatic events, the spaces were painted over two weekends and back in use on a Monday. The paint used was low in volatile chemicals that off-gas a strong chemical odor, reducing the potential for the headaches and nausea that typically result from those fumes. As part of their studio class, the faculty and students from the Color Lab visited CAFLC multiple times to plan the renovations of the public areas of the center, which included the mailroom on the first floor and the reception room on the second. The mailroom and the reception area were both in need of renovations to make the spaces more inviting for families and staff. The spaces did not offer comfortable waiting areas for families to sit, and in the reception space there was nothing to keep children occupied while their parents filled out paperwork. Because the center dedicates their resources to helping families, there are few resources left over for making the space more inviting and comfortable. The Color Lab students created a design process that proposed a color philosophy to highlight the relationship between color and memory. In addition to the renovation protocols HML also added in a small budget for the specification and purchase of new furniture to accommodate the needs of the families, with a focus on the children. The new waiting and mail room at West Harlem Group Assistance. There is a limited amount of natural light in both spaces, but one benefit of the specified lime-based paint is its ability to reflect daylight, creating a small but significant increase in luminosity. Volunteers from HML repainted the reception room walls and ceilings with a bright white lime-based Romabio paint. The Color Lab students then installed brightly colored, painted paper strips to enliven one corner of the room. 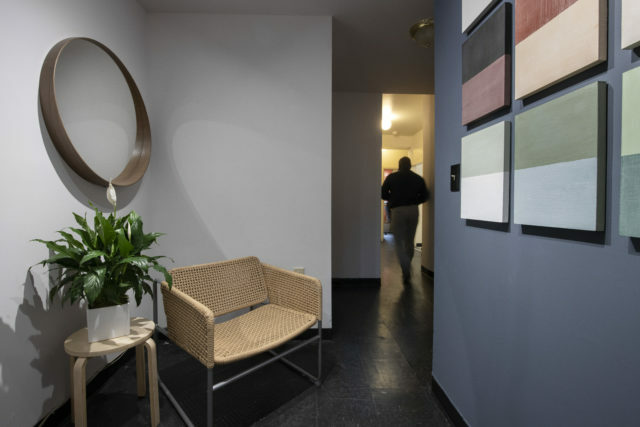 In the mailroom, HML painted three of the walls with the same white paint and added a slate, blue-grey accent wall, and the Color Lab came in to change the lighting to brighten the space and accentuate the new colors in the room. On the mailroom’s accent wall there are fourteen wooden panels, each painted with two Romabio limewash colors. Paired with the slate wall behind them and the lighting, the room is welcoming and bright. Ruben Rankin, who oversees the buildings and maintenance at Convent Avenue worked closely with HML throughout the project. He made sure that the walls were patched and sanded, he helped with the painting, and he kindly assembled the furniture we ordered for the space. He was so enthusiastic and moved by the process he’s planning to do a similar project in his family home. The role of health design has been long overlooked in affordable housing. It is time to recognize the importance of design specifications for health issues such as asthma and cancer, as well as for tenants’ mental well-being. Our work with WHGA ensures that health is prioritized for those who may suffer from more exposure to toxic materials. WHGA takes sustainability seriously and their readiness to change their renovation practices is an example of the kind of forward thinking that can transform housing and improve human health. Simple steps like changing the paint used in renovation can make a significant difference. Note: A range of helpful information and resources is available on the Healthy Materials Lab’s website. Very few building products are made with ingredients that have no human health hazards even for products that are considered better options. When we compare hazards between products, we prefer the product that contains fewer and lower hazards. 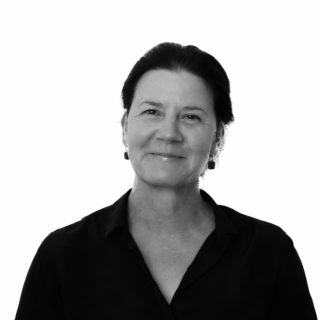 Alison Mears, AIA, LEED AP is an architect, Assistant Professor of Architecture and Director of the Healthy Materials Lab at Parsons School of Design in New York. She is co-Principal Investigator of the Healthy Affordable Materials Project (HAMP). The Project is a coalition of four organizations who work together to incorporate human health as criteria for evaluating building products to improve the interior environments of Affordable Housing.